Synopsis: Rather than looking up an application’s process ID using the Unix command ps and the using renice to increase or decrease the amount of time dedicated to a process, we wrote this utility to give these tasks a GUI front-end. Rather than looking up an application’s process ID using the Unix command ps and the using renice to increase or decrease the amount of time dedicated to a process, we wrote this utility to give these tasks a GUI front-end. To change the amount of time dedicated to a process, click on the lock button and enter the name and password of an administrator-level user. After that, drag the indicator for the slider in the Priority Slice column related to the application you want to speed up or slow down. Alternatively, you can enter a value from -20 to 20 in the Value column; -20 relates to the fastest speed possible, 20 to the slowest speed, and 0 is what most applications are set to when launched. The value in the Unix PID column is the Unix-based process ID in decimal notation for the process listed, and the value in the column Mac OS PID is the process ID in hexadecimal notation that Mac OS X and Classic use to identify its processes. 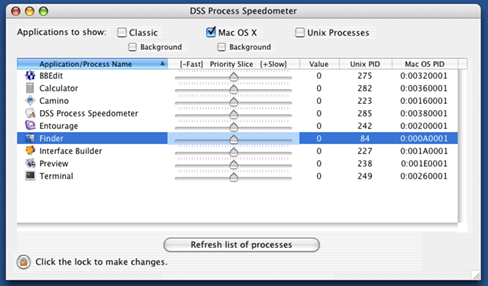 If Classic is running, you can see the foreground and background processes running in Classic by turning on the related check boxes, but you cannot change their speed, as they run in the Classic process, a single Unix process; however, the Mac OS PID values are still shown for your information. The check box for Unix Processes will show those processes running that aren’t tied to a Mac OS process; this feature is currently not implemented. Macintosh Version 1.0a2 of this product is available for download as freeware in the Mac OS X .zip format and is 49,356 bytes (53 KB) in size. Macintosh Version 1.0a1 of this product is available for download as freeware in the Mac OS X .zip format and is 87,183 bytes (86 KB) in size. This web site was designed, developed, and is maintained by DesiSoft Systems. Visit our web site today to find out how we can enhance your existing site, or you can have us build you a customized web site geared to your particular business needs. Copyright © 2000-2007 DesiSoft Systems. All Rights Reserved. The names of other companies and their products and technologies mentioned herein may be the trademarks of their respective owners.